Are You Expecting Too Much In Retirement? When I saw this I nearly fell off my chair. 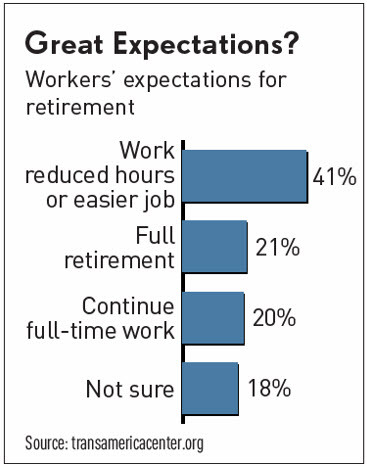 It clearly shows that only 21% of us expect to retire without being forced to work. Of course some of the people in that 21% could be over-confident and may really have to work in retirement despite their financial fantasies. And some of the people in the 79% group could just be a bunch of pessimists with nothing to worry about. I have no idea (and neither do they) unless and until they run some financial projections. But the point is that 79% of us walk around with the mindset that they will have to work for the rest of their lives. They think work will always be mandatory for them – never optional. Yuk. I would hate it if I walked around all day thinking I’d never be financially free. I love my work and never plan to retire. But that’s a choice – not a requirement. And because it’s a choice, I enjoy my day, my work and my life a whole lot more. Happy Pilgrim. Don’t you deserve the same? Of course you do. As I hinted above, there is really only one way to have anything better than a wild guess about what your financial future may look like and that’s to run your financial numbers. You don’t have to be a complete math nerd to do this and you are not required to hire anyone to do it for you. Oh….and it won’t take you more than an hour to do it too. You just need a little patience and the ability to be honest with yourself. Your first step is to figure out what you spend now on average. This is much simpler than you might think. All you have to do is look at your monthly bank statement. It tells what your total withdrawals are each month and that, my friend, is how much you spend. Want this done for you? Let me help! Next, make some adjustments for the future. Your retirement spending might be lower (if you will have paid off your mortgage by then and/or have fewer financial obligations) or it might be higher (more travel and medical costs). Make adjustments and don’t worry about the number being perfect. We’re looking for a ballpark figure. Having this estimate (even a flawed number) is a heck of a lot better than what most people have when it comes to projected retirement spending. Most people don’t have a clue and never think about it. That’s why they walk around with no confidence about their future. Your next step is to project what your retirement income will be once you stop working. This includes Social Security and pensions and these are easy figures to come by. Before we go to the next step, it’s important to consider the value and cost of time. If something costs you $100 today it is going to cost more 10, 20 years down the road because of inflation. And a pension of $1500 today will be greater down the road if those monthly benefits have inflation or cost of living adjustments. In order to compensate for the value and cost of time, you will need to use a “future value calculator” but this sounds much more daunting that it really is. All you really need to use these widgets are you current costs (or pension estimates), the number of years you want to inflate for and an inflation number. I suggest you keep things simple by using an online calculator and inflate your numbers by 3.2%. That’s the long-term inflation rate and it’s a good conservative number to use. Once you calculate your future cost of living and future income, don’t despair if your costs exceed your income. We’re not done yet. You still have your investments to draw from. Use that same calculator to get a ball park figure of what your investments will grow to including annual contributions by the time you retire. Then, multiply this result by 4% to determine what your annual withdrawals could reasonably be. Last, divide the number by 12 to figure out what your monthly income from investments may be. At this point you have an idea about your future cost of living, retirement income and investment income may be down the road. If you have greater projected total income than expenses you are probably in good shape Pilgrim. If not, you still aren’t doomed to a life of never-ending toil. Consider shaving down some expenses now, saving more and investing for growth. That combination might be enough to secure your financial future. If, after going through this exercise you still have a short-fall, you will likely have to continue working during retirement – at least until you figure out how to cut your costs further. But even if that is the outcome, you will be in a much stronger position knowing that your retirement expectations are based on facts rather than feelings. What do you expect for your retirement? Based on what? Good article. I too saw the Investors Business Daily article. It is amazing how many people do not think that they will be able to retire completely. Although there are some people that want to do some type of “busy” work. My father in-law did. He retired after teaching for 30 years. In the summer he mowed fairways. He absolutely loved it. Besides the little extra income he earned, the whole family was able to golf for free.